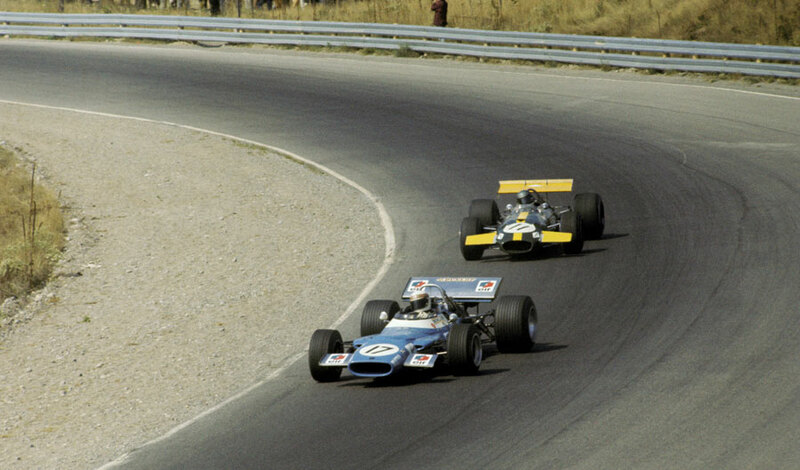 The drivers' and constructors' championship were already decided but that did not in any way diminish from Jacky Ickx's victory, and a Brabham one-two, at the Canadian Grand Prix, the first of three season-ending races in North America. Ickx, who had announced the previous week he would be leaving Brabham, took pole with Jackie Stewart, who had won six of the eight grands prix up to then, back on the second row in fourth. The race turned on an incident on the 32nd lap when Ickx clashed with Stewart - both cars went off the road, and while Ickx was able to continue, Stewart's Matra suffered race-ending damage. There were a number of other retirements. The Lotuses of Graham Hill and John Miles both expired within two laps, the BRMs of John Surtees and Jackie Oliver both blew up, while Pedro Rodriguez's Ferrari suffered from oil, fuel and water leaks. The most serious retirement was that of Piers Courage who received burns when the fuel tank in his Brabham split and filled his cockpit with petrol. Earlier, Jean-Pierre Beltoise, who finished fourth, suffered minor damage in a collision with a local privateer, Al Pearce, who clattered into several other cars including Silvio Moser's Brabham which was taken out of the race. Pearce continued for 22 laps before being disqualified for being too slow, the only man to be black flagged for such an offence. Stewart's retirement left Ickx unchallenged and he eased to victory from team owner Jack Brabham. The sixth-place finisher, Johnny Servoz-Gavin, carved a little piece of history as his Matra was the only four-wheel drive car to score a world championship point.